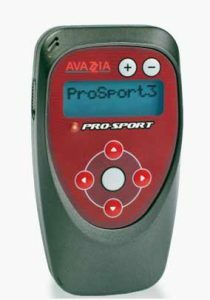 The Avazzia Pro Sport III is without a doubt, the most advanced microcurrent technology on the market today. 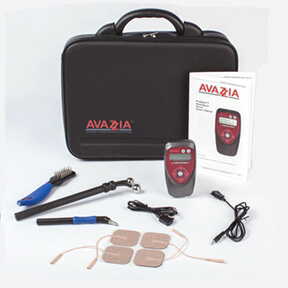 Effective non-drug, non-invasive treatment of acute and chronic pain, this device is chock full of features not found anywhere else. One of the most important facets is that the device is engineered, manufactured and serviced in the USA. It features 53 modes including 19 advanced modes and the ability to program patient specific modes. As such it is an essential piece of technology for any medical professional. PRO-SPORT is an advanced microcurrent device used by professionals, including pain management specialists, orthopedic surgeons, chiropractors, athletic trainers and other healthcare practitioners, to manage, and in some cases eliminate, pain experienced by their patients. Engineered, manufactured and serviced in the U.S.
Advanced engineering allows the user to control power level, pulsing action, damping, modulation and more. Level 1 to Level 3 training allows the practitioner to function at an elite level.